The festival caters for a wide range of talents and participation is expected from all schools in the country. The Primary Schoolsâ Performing Arts Festival is being sponsored by the Professional Secretariat Consultancy Services (PSCS). Cultural Officer within the Department of Culture Anthony Theobalds highlighted that the Ministry recognized the need for identification and grooming of the various talents within the primary schools. Theobalds noted that this festival will therefore not target a specific art form, but will allow students to be expressive in any talent they may have. This program will facilitate visitations to primary schools by Cultural officers, where the adjudicators will engage with students in half-hour concerts. Outstanding students will be selected to represent their respective schools at the grand finals, scheduled for March 16 and 17. On these two days, two children will be selected to be the Prince and Princess of the festival. The two grand days will be televised, to highlight and promote the talents of children here. Director of the Professional Secretariat Consultancy Services (PSCS) Camille Crichton said the Primary Schoolsâ Performing Arts Festival, which is in its fifth year, will once again be assisted by the (PSCS). Crichton said that participation continues to grow, and she encouraged parents and teachers to motivate students in artistic pursuits. 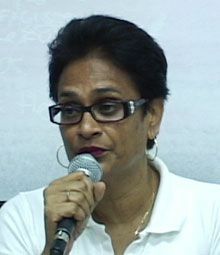 She noted that the Arts can provide alternative avenues of employment for Vincentian youths here. Crichton thanked former Minister of Culture RenÃ© Baptiste for her unwavering support to culture here, over the years. Representing the Ministry of National Mobilization, Social Development, Youth and Sports and Culture, Eli Francis commended the Division of Culture and the PSCS for the timely effort of showcasing support and partnership towards the Vincentian students. He emphasized that the Ministry of Cultureâs goal is to provide opportunities for the enhancement of youths, ultimately reducing poverty within St. Vincent and the Grenadines. Francis, however, called on the private sector to give more support to ventures like these. Representing the Ministry of Education, Education Officer Joffre Venner said that this country has a rich culture and heritage and the Primary Schoolsâ Performing Arts Festival is one way of ensuring that the cultural values are passed on to future generations. He noted that it is recognized that students are being influenced by foreign cultures, thus the need for opportunities, which focus on their own Vincentian culture, is heightened. The Education Officer stated that the creative arts help to foster discipline, develop self-esteem and assist in academic development. Venner urged schools to participate in this activity and also thanked the sponsor Professional Secretariat Consultancy Services.